When 45 nanometer CPUs were first released by Intel there was significant speculation about how durable they would be, it was feared that the drop from Intel’s bulletproof 65nm process to their new 45nm process would result in fragile CPUs. As overclockers worked with them, they found that for the most part 45nm CPUs were not nearly as fragile as feared. It was discovered that they did not like high VTT values at all, but beyond that they were found to be solid. Around this same time motherboard manufacturers released motherboards with a setting generally listed as “Load Line Calibration”, or “LLC”. The instruction manuals and BIOS help screens were less than helpful, describing the setting as “Improves VCORE directly”. Ok, thanks, that tells me a lot. It turned out that what this setting did was prevent the CPU VCORE from dropping under load, a situation known as “vdroop”. Normally if the idle VCORE was 1.300v and you put a heavy load on the CPU the VCORE would drop to 1.28 to 1.24, sometimes even more then .1v! What LLC does is watch for that drop and supply more power to prevent it, keeping the VCORE at a steady level and helping avoid crashes caused by the suddenly lower VCORE. Overclockers were thrilled, this meant they didn’t have to set the VCORE at levels that caused idle VCORE to be through the roof in order to get full load VCORE where they wanted it. Then came an article at Anandtech that used some graphs and logic to prove that LLC actually caused voltage spikes when going from full load to low load. In theory, the voltage regulators on the motherboard could not react fast enough to the sudden change in CPU load, and kept delivering full load power for an instant when the CPU did not need it, resulting in a brief jump in VCORE. There was quite a bit of argument about this, but nobody was able to put it to rest solidly, nor to prove it solidly. Theories abounded. This brings us to today, when I decided that I’d had enough and set out to test the theories with my handy Snap-On MODIS’s oscilloscope function. 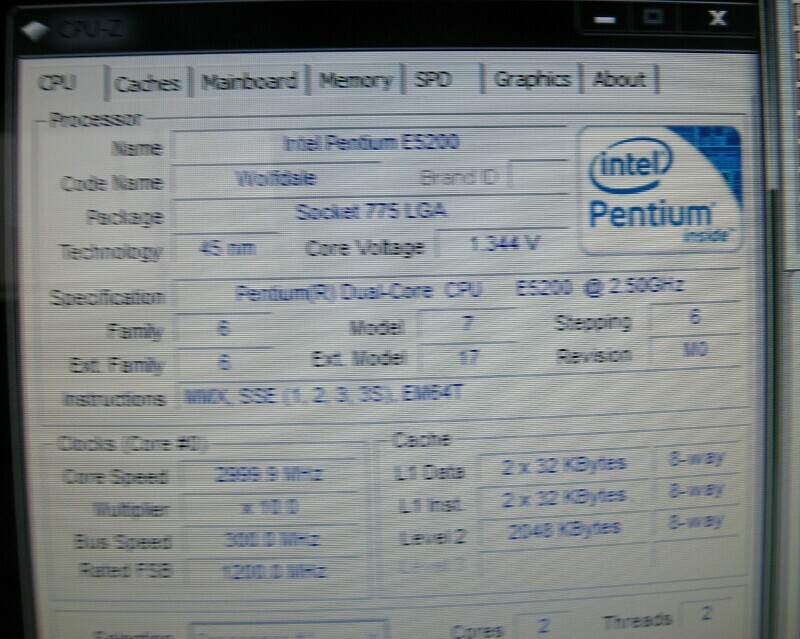 Using an Intel E5200 CPU on my Asus P5Q Pro, I connected the scope input to the output side of one of the inductors that feed the CPU. 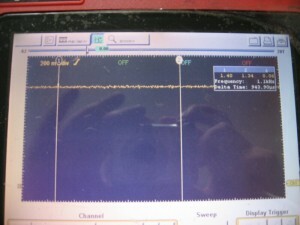 The scope was set to freeze the screen upon detection of any voltage higher then normal. 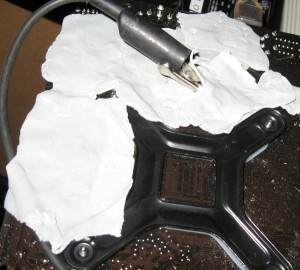 Being a benching team member, I had plenty of kneaded eraser to insulate the motherboard with. If you look closely you can tell the motherboard has also been insulated with conformal coating, as it gets down to -70 ° C or so on occasion. The CPU was loaded with two threads of Prime95’s Large FFT test, and while watching the scope I stopped the load test. Please excuse the reflections in the following pictures, glossy screens in a bright room lead to dubious pictures. First up, the VCORE was set to 1.3625v in bios, this is Intel’s maximum recommended VCORE and seemed like a good level to test. It should be noted that on the P5Q Pro, a LLC setting of Auto means LLC is enabled. 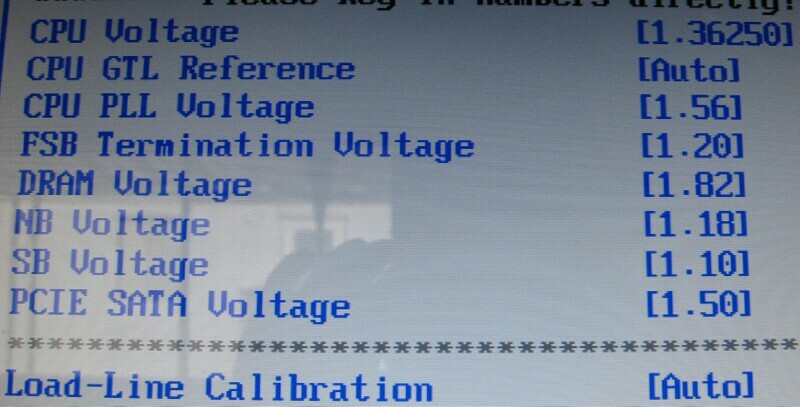 I then rebooted and checked the BIOS’s voltage readout, to get an idea how accurate the sensor was. The scope had a different view on things. 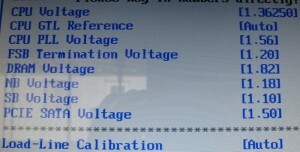 In case you’re wondering, that is the VCORE jittering from 1.4v to 1.34v, with an average of 1.35 or so. It should be noted that the jitters are exactly the same with LLC disabled. 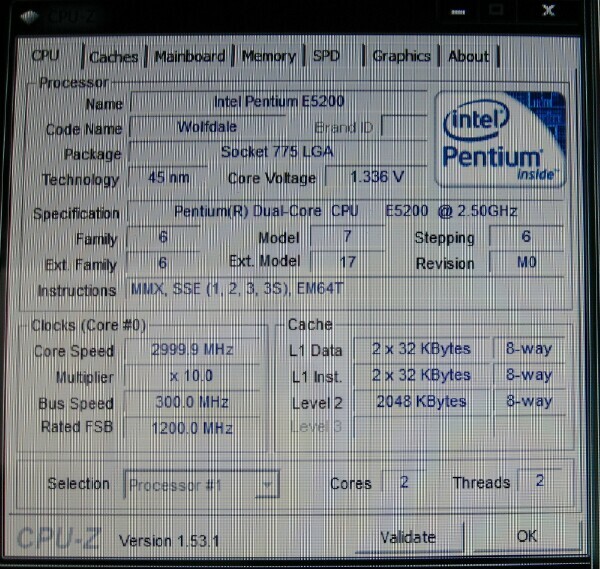 Then it was time to fire up windows, and check CPUz and its interpretation of the VCORE. 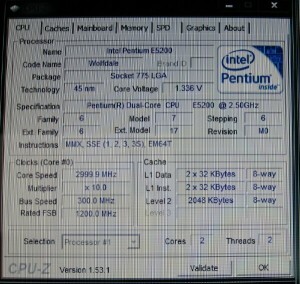 The bios and CPUz don’t agree very well, do they? Under load the voltage recorded by CPUz goes up. Pretty much the same as idle, the highest peaks are .01 higher, and the average voltage is a bit higher. 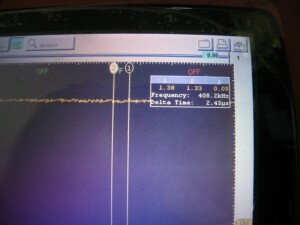 Now it came time for the actual test, removing the load suddenly by stopping the test. With baited breath I hit the button while watching the scope like a hawk. 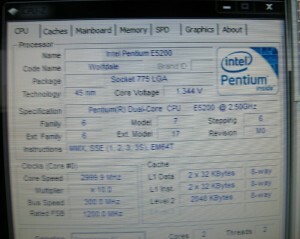 The result was disappointing, the scope saw nothing except a gentle drop in VCORE back to the normal idle level. Figuring the scope must have missed it, I lowered the trigger and made it as sensitive as possible, restarted Prime95 and stopped it again. Nothing. I did this five more times with different scope settings, and found absolutely nothing in the way of spikes. For the sake of completeness, I repeated the test with LLC disabled, the results were essentially the same though the VCORE dropped under load instead of going up. No spikes. If you have a decent quality motherboard LLC is a good thing, and not likely to cause any issues at all. It’s worth noting that the P5Q Pro used in this test is a high quality enthusiast motherboard, it has quite a few nice beefy capacitors to smooth out voltage spikes, and eight phase power to begin with. It is entirely possible that a lower grade motherboard with fewer capacitors may get spikes but I don’t have any I can test. It is also possible that my scope’s 50 microsecond refresh is too slow to capture the spike but I don’t think that this is likely myself. When I first saw the jittery voltage going into the CPU, I was rather disturbed, but after thinking about it I think it’s ok. There are two main types of capacitors (ok, so there are actually a ton, but as far as VCORE is concerned there are two important ones), big ones and little ones. Big capacitors can absorb big voltage spikes and drops but react slowly and can’t catch high frequency jitter/noise. Little capacitors can’t deal with big voltage spikes and drops, but can smooth out jitter and noise. If you look on the motherboard, you’ll see a lot of big capacitors around the CPU socket, those take the 3v to 13v(!!!) coming out of the inductors and smooth it down into whatever the VCORE is. There aren’t any little capacitors in the circuit here. Now if you look at the bottom of the CPU you’ll see that it has a big patch of little tiny surface mount things, most of those are capacitors. At least some of them are in the power circuit, and smooth out the jitters and noise. I can’t test to find out how many of them for two reasons: 1) It’s different on every CPU. 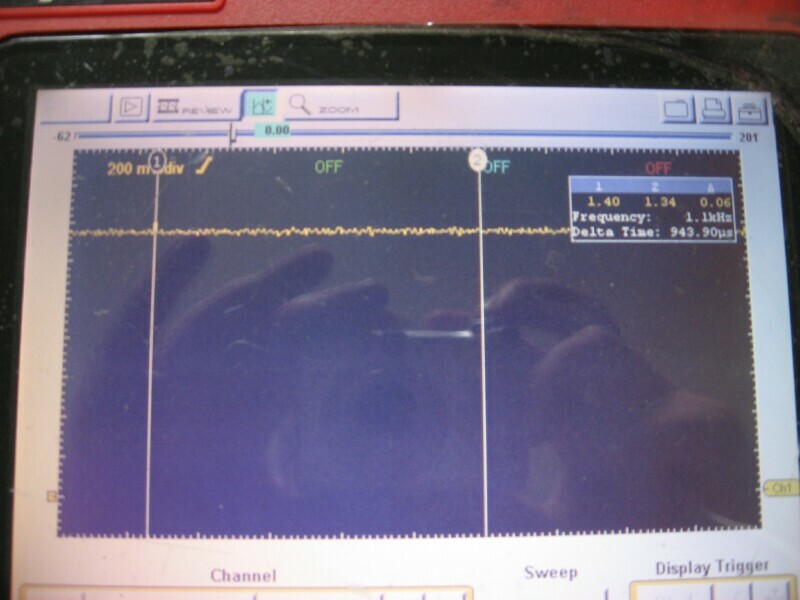 2) My multimeter sends 2v down the line when I check continuity, the CPU would not appreciate this much. In any case, my bet is that by the time the voltage actually gets to the cores it has become much smoother. I would love to see more data. I don’t really recommend prodding your motherboard with metal clips and wires as it can cause instantaneous destruction of the motherboard, the CPU, your PSU, and possibly the world. If however you want to risk it, please let me know what you find out. In the mean time, enable LLC and enjoy the stable VCORE! 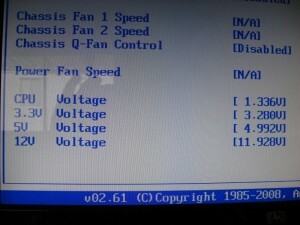 One thing I didnt see (if I missed it I apologize) is the flip side of using LLC is that under moderate/light loads where the the LLC isnt active/compensating for vdroop it could potentially cause reboots/failures due to not enough voltage being supplied to the CPU in an idle or light load state. This condition becomes more apparent when LLC is enabled and the load voltage goes UP (vRaise?) 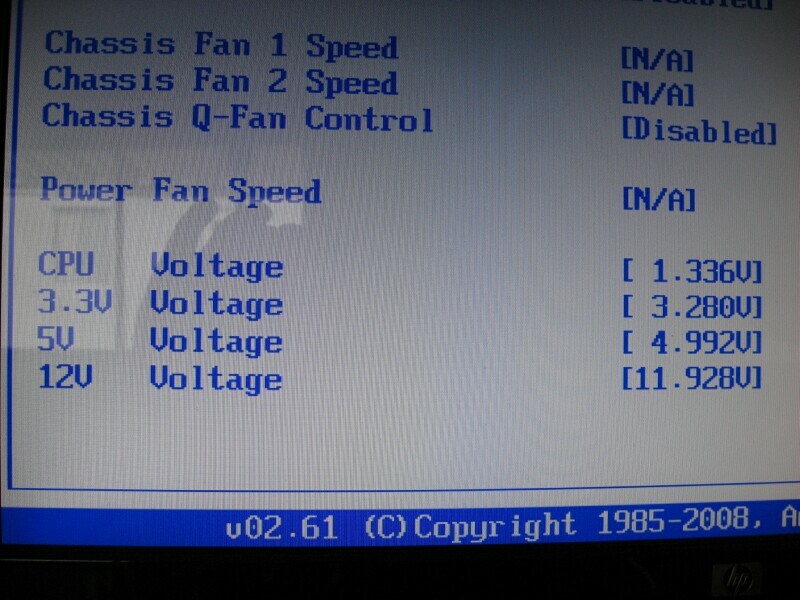 as opposed to keeping the idle/set voltage and the user lowers the voltage in the bios to compensate. I would, and do still use it, however I enable it after I have my overclock set and stable. Sometimes, albeit it rare, LLC/Vdroop control has been known to cause instability in some situations. I agree with EarthDog. Can we see some results going from idle to full load? That is usually where the spike occurs. Besides that, very well done. The problem as I understood it is simply in the user compensating too much for the spike (as in goes above idle voltages) that does occur with LLC. The spike is there, its just the user trying to make it the same as the idle voltage is where this problem comes in to play. I kept watch for spikes when the load hit as well, nothing there either. I haven't seen any odd vcore with LLC enabled at light load unless I've had EIST and/or C1E enabled, in which case vcore in any situation is anybodies guess. I had fun doing this, when I have a 1156 setup again I'll test it, as well. Its not an 'odd vcore' its that people tend to compensate for the overvoltage LLC gives you on load and they lower the vcore to compensate causing instability at idle/low loads. I wouldnt imagine this happening to those in the know, but to others as I have seen it happen. Ahh ok, that makes sense. I haven't run into that personally, but my board doesn't gain a whole lot. Maybe its just the 'noobs' then? I havent run into this issue either, but then again, I dont touch the vcore after LLC is enabled either later in my 24/7 stabel o/c process. Oh I don't mind. I ask plenty of annoying questions myself, I'm happy to answer other people's questions. Nice to see some real investigation into this. But if I had to guess I'd say there's a very good possibility that the voltage spikes are <50us. When you say your scope "refresh rate" is 50us, do you mean your scope takes a sample every 50us (i.e. 20 kSamples/s)? Or that each time division is 50us? In either event, that's probably too slow to see a voltage spike that occurs on a nanosecond scale. I have some nice scopes at work that can go down to nanoseconds, but getting a computer in here to test them would be rather difficult. I chatted with a co-worker who has experience in power supplies and this is what we came up with as far as the voltage spikes go: it is far more likely to see a large spike going from heavy to light loads as opposed to light to heavy. Switching regulators on a motherboard have a feedback loop that makes sure the voltage is what its "supposed" to be. When the load increases, the feedback loop has a fixed slew rate that determines how fast it can react, and it will definitely be slower than the time it takes to go from a light load to a heavy load. The light-to-heavy spike comes from an overshoot in the feedback loop where it continues ramping the power up beyond what is necessary to maintain the voltage. But the feedback loop keeps chugging along and brings it back to normal very shortly after. The voltage spike going from heavy-to-light is worse. Switching regulators work by storing energy in an inductor then passing it to the load. The output voltage is controlled by the duty cycle of a pulse-width-modulation signal used to do the switching. If the current goes beyond a certain limit, that voltage will start to droop because energy isn't being transferred fast enough. The solution is to increase the duty cycle to supply extra current. But if all of a sudden you drop the current draw (going to light load), the duty cycle is still longer, and since the regulator isn't strained the voltage will spike. The feedback loop comes into effect and lowers the duty cycle, but you'll still see a large spike before it reaches equilibrium. Oh I got the point of the article. I'm just providing some more theory as to what should be seen and suggesting that someone take a look with a higher-speed scope just to be sure. I agree, it'd be nice to use a finer grade scope with this, if this article can inspire someone to do that I will be very pleased. Thanks for the details on how the power supply works, too. Thanks for this article, Bob. 50uS per screen (50 microseconds), the finest point it can detect/display appears to be 90-120 nanoseconds, somewhere in that area. Kayson would be correct in his description of how the switch mode setup should work. Part of where the spike could come from is that time lapse between the cpu going from full load to light load in a matter of cpu cycles. Now if that really happened then the cpu PSU (the switch mode parts you are testing) would have a cycle time much longer and potentially supply a dangerous voltage. I would think that a large part of this issue might deal more with the feedback circuit than the actual regulation itself. Most of the capacitors and inductors are sized to meet a goal load/regulation requirement. The capacitors would need to store enough juice to be able to go from light to heavy load quickly, but that size should be able to handle ripple in the sub 1 volt category easily. That's just my theory based on my experience with larger scale switch mode ic chips.